It's hard to believe that we're already midway through March, but today is the 15th, and that means it's time for another update on the Einkorn Experiment! 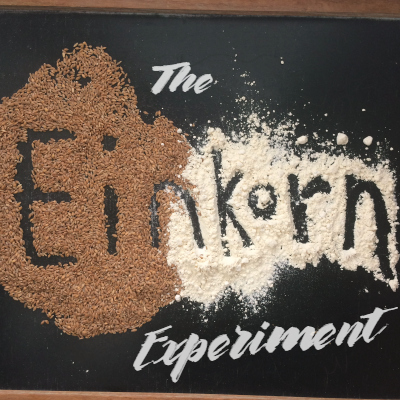 Since I talked about einkorn flour three months in a row, I wanted to switch things up and share my latest experience with the whole einkorn wheat berries this month. The einkorn wheat berries are very similar to farro, in fact, sometimes the names are used interchangeably on packaging (though they probably shouldn't be). But, since farro has been a favorite of mine for years (meaning I've used it enough to be pretty familiar with it), I have noticed a little difference between the two. Einkorn berries seem to be slightly smaller than farro berries, which makes them a little less chewy (one of my favorite things about farro). But in general, you could successfully use one in place of the other. You can also add pearled barley and spelt berries to that list, and I'm guessing any other wheat berry. 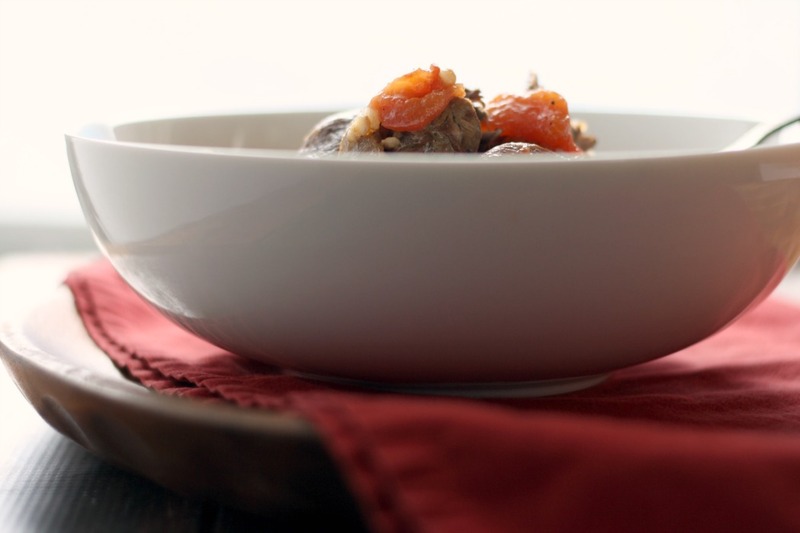 So, if you're looking for ways to add einkorn berries to your diet or cooking repertoire, a great place to start would be with recipes you are probably already familiar with like Beef Barley or Mushroom Barley Soup. And don't be afraid to use the einkorn berries in warm breakfast porridge or hearty salads, they add a nice toothsome sort of comfort to a dish. 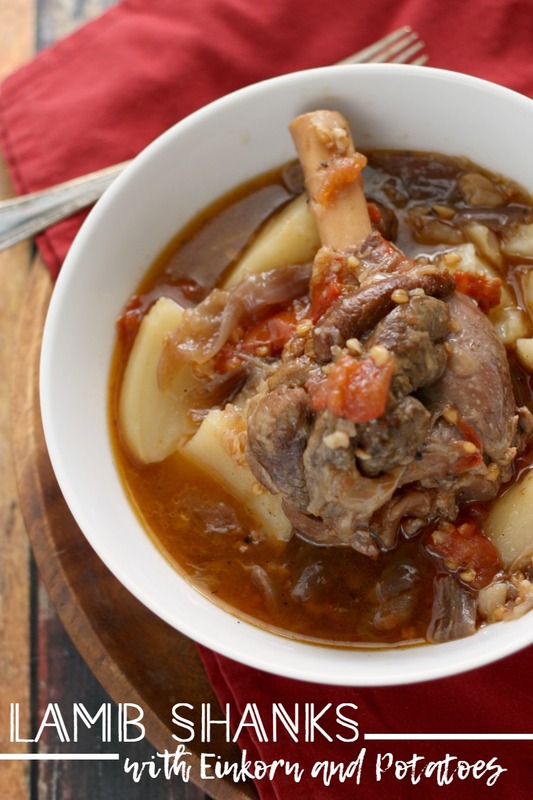 Speaking of comfort, does it get any more comforting than slow cooked lamb shanks, meat so tender it just falls off the bone, nestled in a rich broth alongside plump einkorn berries (traditionally barley) and floury potatoes? 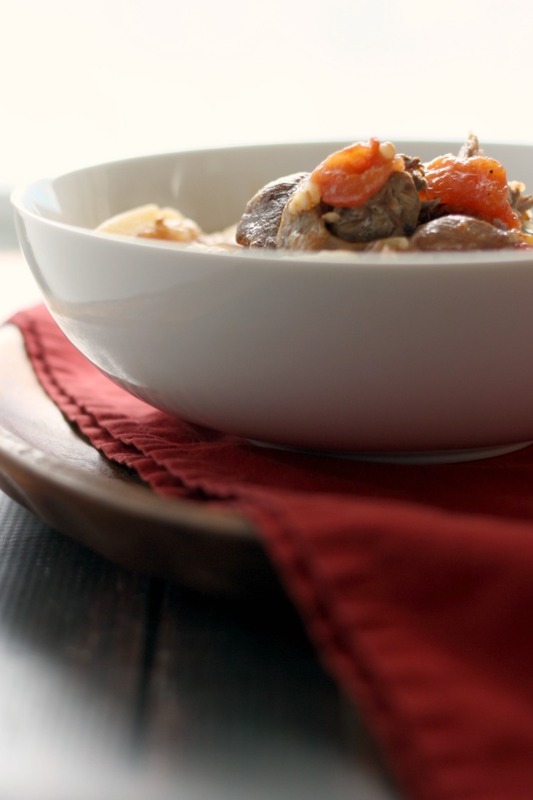 The lamb may be the star of this spin on the traditional Irish stew (which uses barley), but it wouldn't be complete without every other component. Whole wheat berries are definitely my favorite use of einkorn to date. I hope you'll hop over and visit Lora at Savoring Italy to see what her einkorn experiments yielded month—these fantastic Italian Wine Einkorn Cookies (Ciambelline al Vino Rosso)! 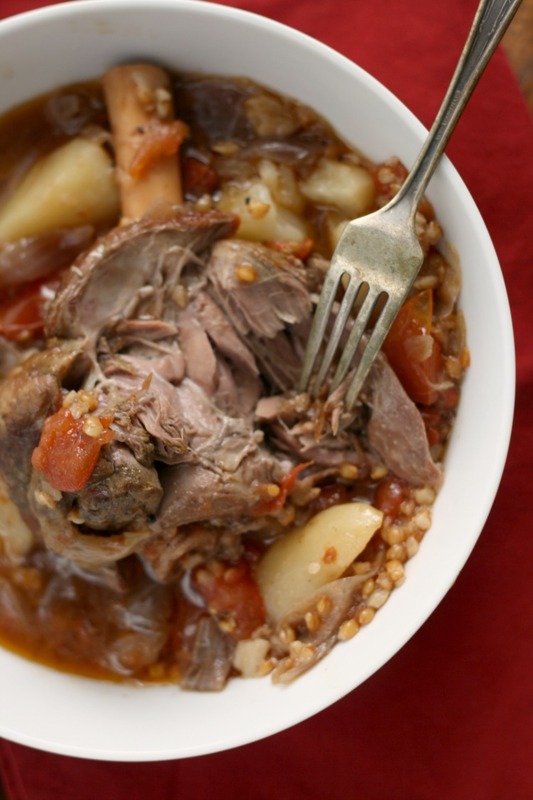 Lamb so tender it falls off the bone is the highlight of this comforting spin on the traditional Irish stew that includes einkorn wheat berries, potatoes, and tomatoes. 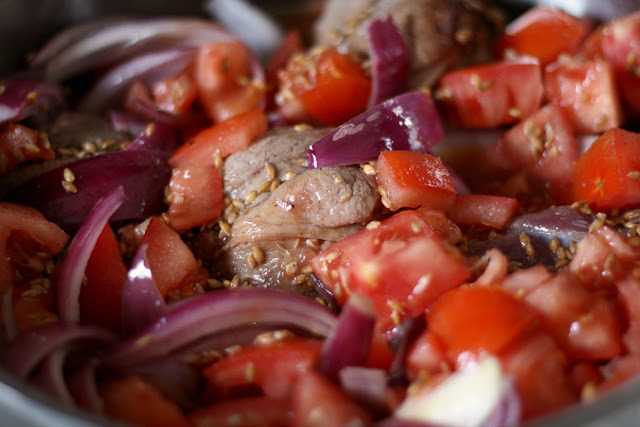 Pour the oil into a Dutch oven or 5 to 6-quart casserole dish set over medium-high heat. 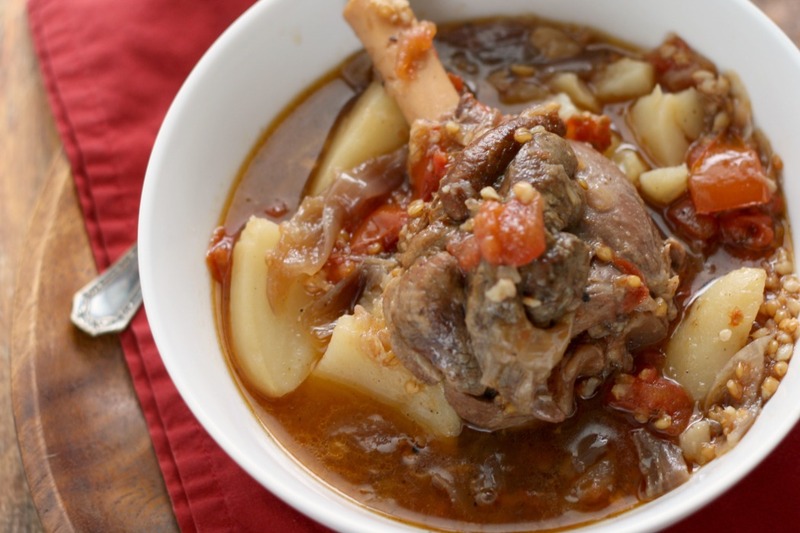 Season the lamb shanks generously with salt and pepper, and when the oil is hot, carefully add to the pan. Cook until the lamb is lightly browned on all sides, ~12 minutes total. Add the onions and garlic to the pan and let cook for a couple of minutes. Stir them around, then add the tomatoes, einkorn wheat berries, and honey. Pour the stock/broth over everything and give it a toss so that everything is well distributed, and bring to a boil. Put the lid on the pot and slide into the hot oven for 2 1/2 hours. Add the potatoes, cover once again, and return to the oven until the potatoes are cooked through and the lamb shanks are meltingly tender, 50 to 60 minutes longer. ©All Roads Lead to the Kitchen. Adapted from Rachel Allen's Lamb shanks with potatoes and pearl barley recipe from her cookbook, Rachel's Irish Family Food.